Many people rank The Godfather (1972) starring Marlon Brando as one of the top films of all time. 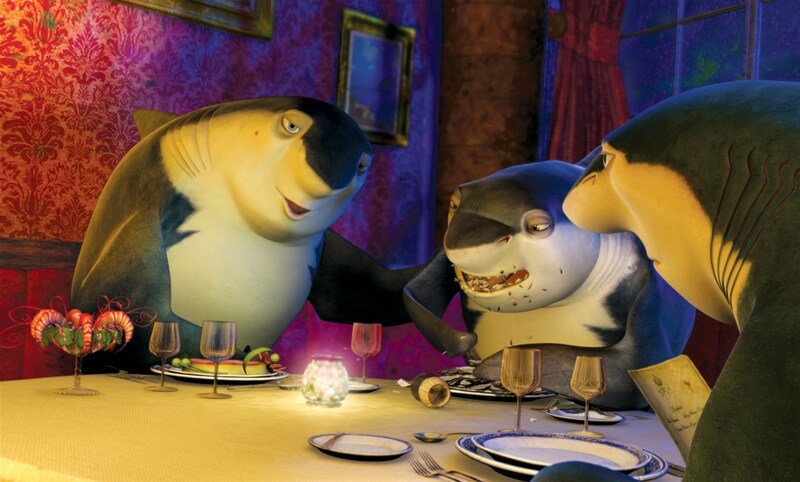 "Shark Tale" (2004), directed by Vicky Jenson, Bibo Bergeron and Rob Letterman and written by Rob Letterman and Michael J. Wilson, takes the milieu of "The Godfather" and transfers it to fish in the open sea. As sort of a poor man's version of the previous year's "Finding Nemo," Shark Tale does not have quite the same innocent joy and spirit of that earlier film, but does manage to entertain in its own more complicated fashion. 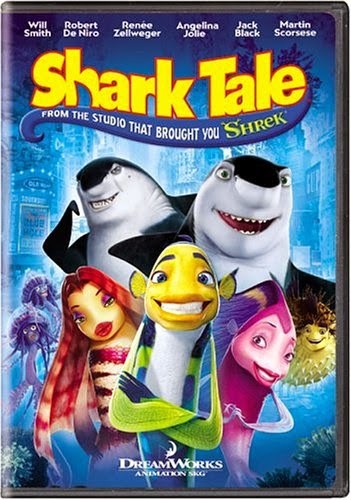 While aimed at children, "Shark Tale" manages to be entertain adults with its repeated sly references to "The Godfather" and other gangster films. Oscar, a bluestreak Cleaner wrasse, is a humble scrubber at the local Whale Wash. He dreams of fame and fortune, and has borrowed beyond his means from his boss, a "loan shark" porcupinefish named Sykes. Unwilling to wait any longer to be repaid, Sykes demands that Oscar repay the "5000 clams" by the following day. Oscar leaves and tells his angelfish friend Angie, who volunteers to pawn a family heirloom to get the money. They do this, but Oscar still thinks that he will hit it rich, and acting on a hunch, goes to the racetrack. Betting all the money on a "sure thing," Oscar loses everything after being distracted by floozy lionfish Lola. Elsewhere, in the wreck of the Titanic, a criminal family of Great White Sharks is deciding what to do about Lenny, a son who does not want to be a gangster. Not only that, he is a vegetarian. His father, Don Lino, tries to teach Lenny to be brutal, so he sends him out on a mission with Lenny's brother Frankie. Frankie, though, spots Oscar about to be bumped off by two of Sykes' goons, Jamaican Physalia Physalis fish named Ernie and Bernie. Frankie tasks Lenny with attacking Ernie and Bernie, and during the melee, Frankie is killed by an anchor. Lenny flees the scene in terror, while everyone assumes that Oscar killed Frankie. 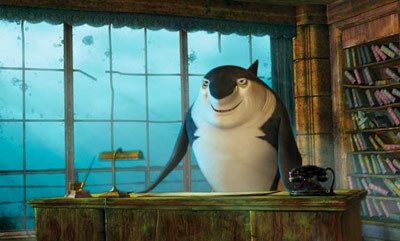 Now nicknamed "Sharkslayer," Oscar meets Sykes and engages him as his manager, while Lola becomes his girlfriend. Don Lino, though, is angry and orders his minions out to find Lenny. Oscar is forced to try and fight off Don Lino's thugs, and he meets Lenny. Together, they agree to keep secret the circumstances of Frankie's death. As part of the ruse, Lenny pretends to attack Oscar's town, and Oscar pretends to fight him off. Oscar then leaves Lola for Angie, which angers her, while Don Lino is eager for revenge. Don Lino kidnaps Angie, so Oscar and Lenny (disguised as a dolphin) go to see him and Lola. Threatening to eat Angie, Don Lino tries to force Oscar to surrender to him, but Lenny temporarily frees Angie. Don Lino recovers Angie and then chases Lenny. Oscar leads Don Lino to the whale wash, trapping Don Lino, then confesses that he did not kill Frankie. Don Lino apologizes and makes up with Lenny and Oscar, while Oscar becomes manager of the whale wash and settles down with Angie. The cast is populated with veterans of classic gangster films along with several popular younger stars. Will Smith is the standout as Oscar, with Jack Black playing the friendly Lenny and Renee Zellweger as Angie. Robert Deniro, Martin Scorcese, Michael Imperioli, and Vincent Pastore voice Don Lino, Sykes, Frankie and Luca (Don Lino's minion, an octopus). Katie Couric and Peter Falk also appear briefly as a breathless local reporter and Don Lino's friend Don Ira Feinberg, respectively. 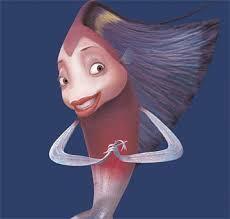 While definitely a fun film, "Shark Tale" is not quite a classic. The plot is convoluted, based on shifting allegiances and predatory behavior that may mystify some children. While "everybody" knows "The Godfather," that might not quite be true for children, so they may not get some of the references to that film. The male/female relationships also might be confusing for kids, such as Lola changing sides for seemingly no reason. The whole atmosphere of crooks and threatening behavior simply isn't very gentle for small children, and everything revolves around crooks "getting even," which is an edgy theme for a children's movie. 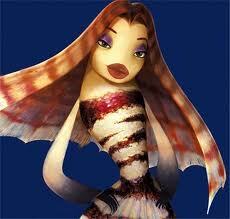 The soundtrack is a highpoint of "Shark Tale," but it also reflects the contrary tendencies of the film. While the capable Hans Zimmer provides the background music, Christina Aguilera, Mary J. Blige, Missy Elliott, Ziggy Marley and Sean Paul contribute songs perhaps best appreciated by older viewers. None of them are particularly at the tops of their game, but they give the film welcome doses of energy. The animation is fine, but all the characters are drawn in a bulbous, puffy style that makes them look as though they ate too much for lunch. The sharks also tend to look a bit too much alike to always be able to tell them apart until they speak. From a purely aesthetic viewpoint, none of the characters is particularly attractive, even the supposedly vixenish Lola, who instead has a trampy look. All that said, people familiar with the films of Scorcese, Deniro and Falk will have a fun time with "Shark Tale," while others who enjoy current celebrities such as Jolie, Black and Couric will also enjoy their viewing time. Children will perhaps identify with the somewhat innocent main characters. 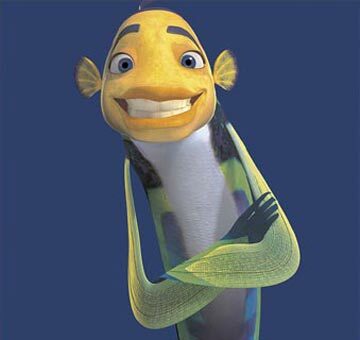 "Shark Tale" is a film aimed at children that they really can't thoroughly appreciate, so it is "neither fish nor fowl" in terms of being a kid's film or a more adult, Pixar-like animated feature film. 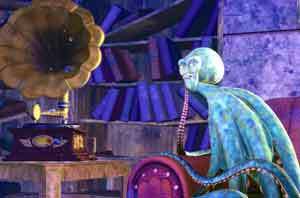 While a moderate success at the box office, grossing $367 million worldwide, "Shark Tale" was eclipsed by the bonanza success of "Finding Nemo" and fellow Dreamworks Animation film "Shrek" and its sequels. Find a copy and enjoy a visit with this wacky bunch of crooks, but expect a more complicated tone than you might be used to in a children's film. 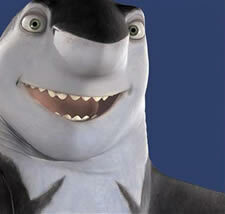 Below is the original trailer for "Shark Tale."